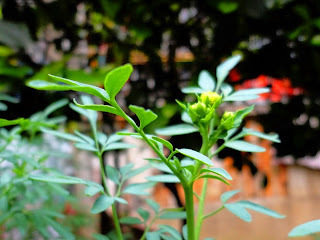 Rue is a herb I have been growing on and off for many years. 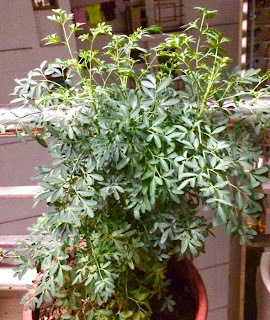 It is a genus of strongly scented evergreen subshrubs 20–60 cm tall, in the family Rutaceae, native to the Mediterranean region, Macaronesia and southwest Asia. I love their bluish-green, fern-like leaves which have a strong aromatic scent, but their sap causes skin irritations in some people though not all. The leaves taste bitter, but The bitter leaf can be added to eggs, cheese, fish, or mixed with damson plums and wine to produce a meat sauce. 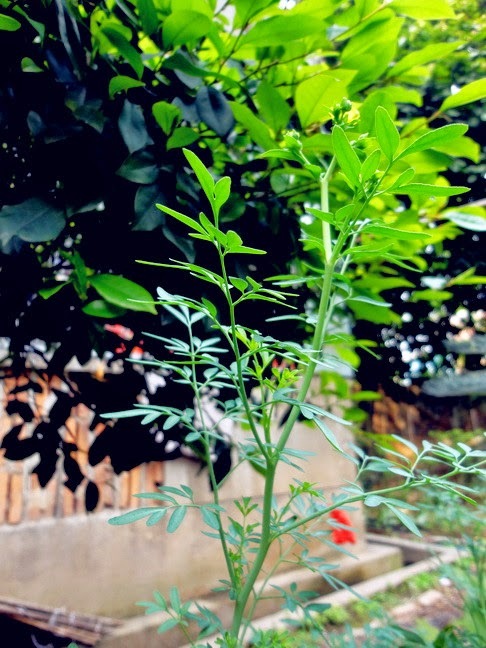 In China, where it is known as chou-cao or "stinky grass" in Hong Kong, In some Chinese cantonese soup recipe, it is used to cook with green bean. In Italy the leaves are used to flavour grappa della ruta, a form of brandy and also make their way into salad mixes as the Italians are fond of their bitter greens. Recently I do some research on this herbal plant and find something interesting beside its commonly known as cooking green bean use. 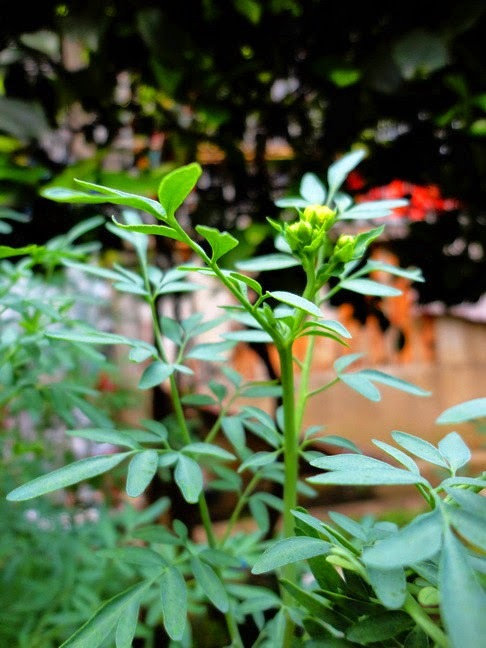 Rue can be harvested and used in the house as an insect repellent. Simply cut some of the leaves and dry them, then put the dried leaves in cloth bags. These sachets can be placed where ever you need to repel bugs. 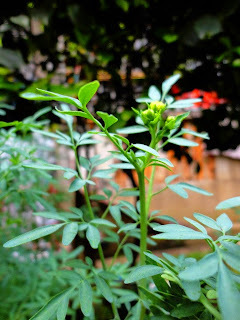 Some online article talk about its Medicinal uses: Extracts from rue have been used to treat eyestrain, sore eyes, and as insect repellent. In folk medicine, rue has been used as an antispasmodic, sedative, and as a treatment for menstrual problems, to treat menstrual disorders, circulatory disorders, inflamed mucosa, toothache. 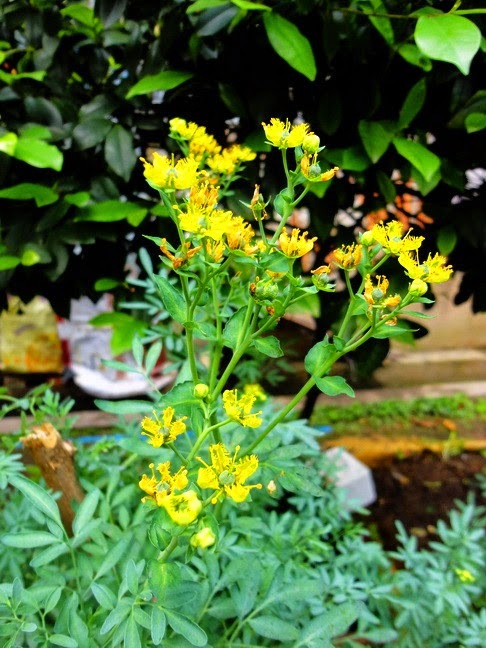 In some cultures, rue extracts have been used as abortifacients. Documented adverse effects, including emmenagogue and abortifacient effects. Rue has been used historically as tea to induce miscarriage by thousands of women all over the world from the Mediterranean, and Europe to Latin America and North America. Rue is a traditional abortifacient used by the Hispanic people in New Mexico.